The banking industry is faced with competing priorities, continued internal challenges and heightened competition that could make profits evaporate. With consumer expectations increasing, the cost of 'catching up' could make some organizations disappear altogether. Since the 2007/2008 financial crisis, the banking industry has been challenged by the uncertainty of regulatory reforms that were intended to enhance the financial sector’s stability and resilience. Today, managing the impact of regulations is still a looming concern, but it has moved to second place as an organizational challenge, behind the need for increased profitability. For the tenth consecutive year, Temenos has conducted a comprehensive banking survey, covering areas such as the industry’s corporate and IT priorities, business challenges, competitive trends and progress to becoming more digital. Because the questions are largely consistent from year to year, the survey (this year developed in partnership with Accenture) enables a tracking of how trends and attitudes change over time. As found in the 2018 Retail Banking Trends and Predictions report, fewer banks are citing fintech companies as their biggest source of competition compared to last year. Instead, the vast majority of survey respondents to the Temenos-Accenture survey want to work with fintech companies. This movement towards fintech partnerships is consistent with the impact of new open banking regulations in the UK. In fact, as found in other similar research, the majority of banking organizations see open banking as an opportunity as opposed to a threat. 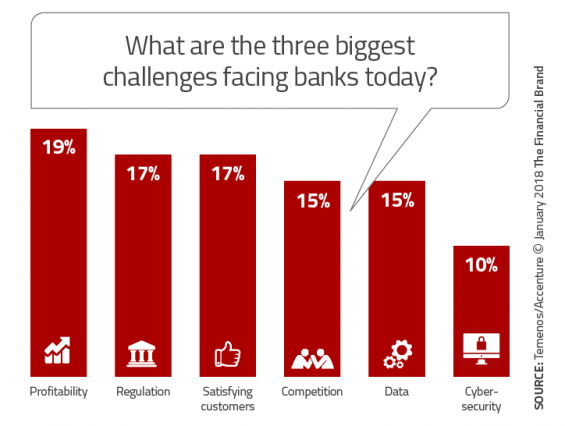 This comes at the same time that UK banks find challenger banks to be more of a threat than in the past, and where large tech firms are seen as a greater competitor. 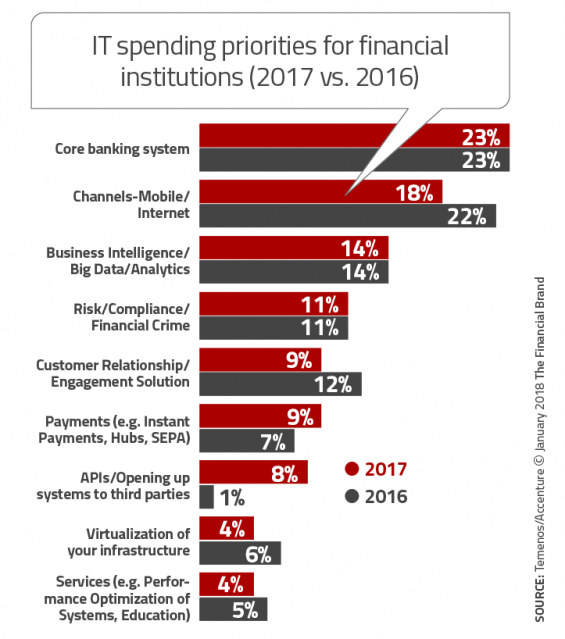 To respond to all of these challenges, financial institutions continue to increase their spending on IT, digital delivery and core systems upgrades. To this end, 32% of respondents said legacy systems represent the biggest barrier to digitization, far ahead of issues such as lack of strategic focus (14%) or lack of skills (12%). In some regions, such as Europe, the profitability of the largest banks is still about half of 2006 levels, making profitability a greater challenge than in other regions. Satisfying the needs of consumers was considered an equal challenge to meeting regulatory requirements, with competition and data both being lower, but equal, challenges. Surprisingly, managing data and using it effectively was cited as an organizational challenge by 3% fewer bankers in this year’s survey, compared to last year. It is interesting to note that over the ten years of the Temenos study, the percent of financial institutions mentioning compliance as a major challenge has gone down from a high of 32% in 2009 to 17% in each of the past three years. From a regional perspective, Europe ranks regulations as a much higher challenge than other regions of the world (Americas, MEA, APAC). The definition of banking is being transformed as organizations prepare for a new banking environment that allows for expanded authority and opportunity while lowering barriers to entry and distribution of financial services. 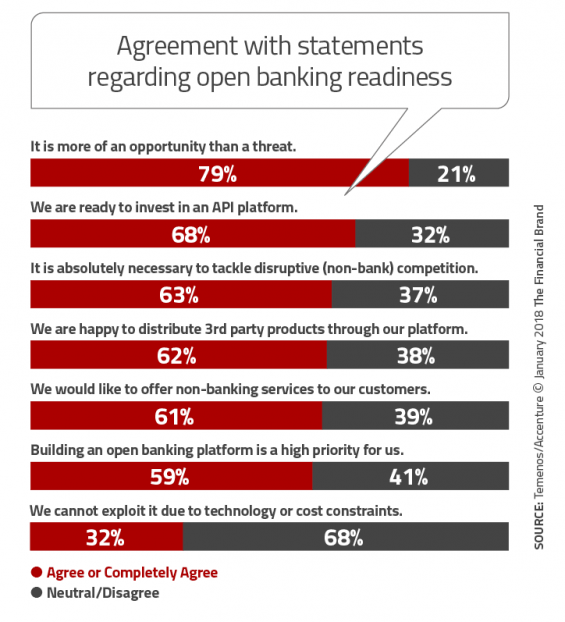 The good news, according to the Temenos-Accenture research, is that 79% of responding organizations see open banking an an ‘opportunity,’ and that 68% are ready to invest in an API platform. Organizations understand that they can not stand on the sideline as cloud technologies, digital distribution, increased data, enhanced analytics and new regulations provide opportunities to provide banking services without ‘being a bank.’ Most organizations will be faced with the decision whether to be at the hub of a new banking ecosystem or to be one of the spokes. As we look at the trends over the past three years, there has been a significant acceptance of the reality of open banking. In 2015, just slightly over half of the organizations (52%) saw open banking as an opportunity compared to 79% this year. More dramatic, the number of organizations considering the building of an open banking platform as a high priority has almost doubled to 59% over the past three years. As was found in the 2018 Retail Banking Trends and Predictions report, more banks now see fintech companies as an ally for going forward as opposed to a threat. Only 16% of bankers today see fintech companies as their biggest competitive threat, down from 19% in the 2016 Temenos study. Instead, most financial institutions are seeking to build partnerships with fintech companies. While the desire to partner with fintech firms has increased, there is a greater realization of the challenges of working with outside partners, especially in the areas of engagement, integration, security and regulatory compliance. All of these barriers impact time-to-market, which is one of the reasons to partner in the first place. While the perception of fintech start-ups as a threat has gone down, the biggest perceived threat now are new challenger banks (22%), followed by existing large incumbent banks (20%) and technology vendors (20%). The increase in perceived threat from challenger banks has risen in each of the past three years, fueled by significantly more accommodating regulations in Europe. In response, many legacy banks are launching challenger brands themselves. “We predict that many new banks will launch challenger brands in 2018 and beyond, creating a more nimble entity with which to prosper in the digital age,” states the report. 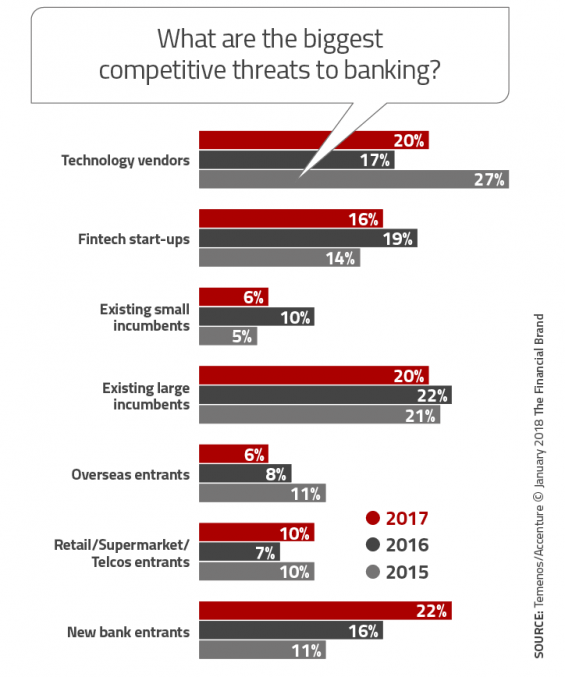 It is not surprising that banks remain very concerned about the threat from big technology providers, with 20% of bankers seeing them as their biggest competitive threat, up from 17% in 2016. While the top IT spending priorities overall make sense, some of the shifts in spending priorities raises questions this year. For instance, few would question that investing in core banking systems should be the top priority (23%), or that there should be a significant increase in the investment to support APIs and open banking (from 1% to 8% in 2017). On the other hand, most observers would question why there would be a decreased emphasis on investing in mobile or Internet channels (22% to 18%) and a decrease in emphasis in supporting customer relationship/engagement solutions (12% to 9%). Do financial organizations believe they have done enough in these key categories? The good news is that a record-level of bankers surveyed (68%) indicated that they expected an increased IT budget in 2018, so the shift in prioritization could be offset by overall increases in dollars allocated. As mentioned in The Financial Brand article, ‘Being a Digital Bank Goes Beyond a Pretty App,’ new digital banking models are required that include both back-office and front-facing transformation. This includes a digital core banking platform that will include consolidated data-sets, real-time insights, flexibility and increased scalability. Continuing to run on legacy applications in the back- or middle- office will prevent banks from achieving true digital banking benefits states the Temenos-Accenture report. 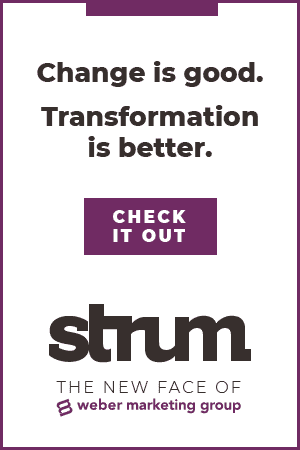 Slightly more than one-third (32%) of survey respondents acknowledged that legacy systems (19%) and data siloes (13%) can be the biggest barrier to adopting a true digital strategy. Not surprisingly, the Americas and Europe were the two regions where legacy systems were considered the greatest barrier. As most bankers in these regions know, some systems date back to the 70’s. The banking industry has dodged many bullets in the past. From the financial crisis of 2008, to the changing of the way banking services are delivered and consumed, the industry has survived making ‘modifications’ to previous business models. Never before has the banking industry faced as much competition from new players, less loyal consumers who are expecting more, changing regulations impacting the overall banking ecosystem and new digital technologies for developing and delivering banking services. Responding to these changes is impacting the bottom line of banking. Profitability is the number one concern of financial institutions as we enter 2018. Despite these concerns around profitability, the delta of increasing vs. decreasing IT budgets is the highest ever recorded – with much of this new investment going into into digitization efforts. 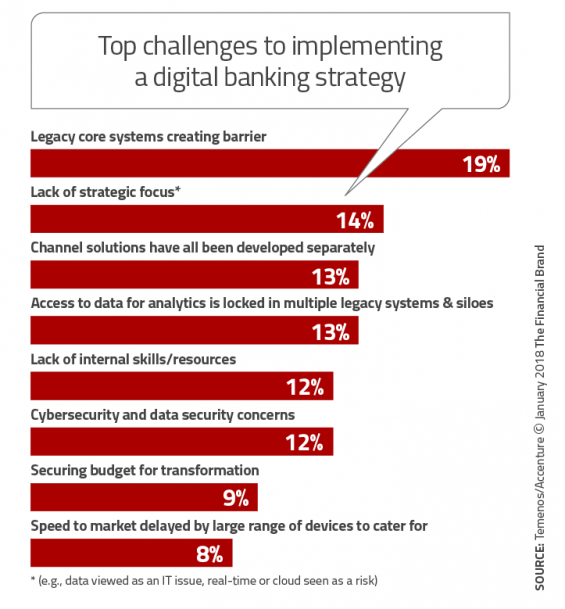 Banks are recognizing that survival in the digital age will require many of the components of challenger banks and large tech companies, including the ability to build a digital organization from the inside out, to process data that will provide real-time solutions for consumers and to partner with fintech firms to improve speed to market and increase innovation. Those firms that embrace the opportunity, as opposed to ignoring the challenges, will be those that survive and thrive in the future. This article was originally published on January 22, 2018 . All content © 2019 by The Financial Brand and may not be reproduced by any means without permission.